This paper presents field measurements of HONO and a range of other gas phase and particulate species from an urban background site in London. The measured daytime HONO cannot be reproduced with a simple box model and thus a significant daytime missing source of HONO is present. We show that this missing source could be responsible for 40 % of the OH radical source and 57 % of the OH initiation; hence its potential importance for atmospheric oxidation and ozone production. The variation of aerosol indirect effects (AIE) in several climate models is investigated across different dynamical regimes. Regimes with strong large-scale ascent are shown to be as important as stratocumulus regimes in studying AIE. AIE over regions with high monthly large-scale surface precipitation rate contributes the most to the total aerosol indirect forcing. These results point to the need to reduce the uncertainty in AIE in different dynamical regimes. Secondary organic aerosol (SOA) affects climate change, human health, and cloud formation. We examine SOA formation from the biogenic hydrocarbon α-pinene and observe unexpected experimental results that run contrary to model predictions. Various processes are explored via modeling to rationalize the observations. The paper identifies the importance of further constraining via experiments various steps in the chemical mechanism in order to accurately predict SOA worldwide. Mixing ratios of NO2 and HCHO in the free troposphere are obtained from MAX-DOAS measurements at two mountain stations at midlatitudes and in the tropics using a modified geometrical approach. The method is applied in the UV wavelength range and, thus, allows the detection of HCHO mixing ratios, in addition to NO2. We find that mixing ratios of both species are increased in the tropical free troposphere due to biomass burning. We have incorporated an idealized snowpack with a nitrate photolysis parameterization into a global chemical transport model (GEOS-Chem) to examine the implications of snow nitrate photolysis for boundary layer chemistry, the recycling and redistribution of reactive nitrogen, and the preservation of ice-core nitrate in ice cores across Antarctica and Greenland. We also examine the sensitivity of these processes to meteorological parameters and chemical, optical, and physical snow properties. In this paper we assess the potential climatic impacts of geoengineering with sulfate, black carbon and titania injection strategies. We find that black carbon injection results in severe stratospheric warming and precipitation impacts, and therefore black carbon is unsuitable for geoengineering purposes. As the injection rates and climatic impacts for titania are close to those for sulfate, there appears little benefit of using titania when compared to injection of sulfur dioxide. The frequency of occurrence and shortwave direct radiative effects (DRE) of above-cloud aerosols (ACAs) over global oceans are investigated using 8 years of collocated CALIOP and MODIS observations. We estimated that ACAs have a global ocean annual mean diurnally averaged cloudy-sky DRE of 0.015 W m−2 (range of −0.03 to 0.06 W m−2) at TOA. The DREs at surface and within atmosphere are −0.15 W m−2 (range of −0.09 to −0.21 W m−2), and 0.17 W m−2 (range of 0.11 to 0.24 W m−2), respectively. Trees can impact urban air quality. Large emissions of plant volatiles are emitted in Beijing as a stress response to the urban polluted environment, but their impacts on secondary particulate matter remain relatively low compared to those originated from anthropogenic activities. The present study highlights the importance of including stress-induced compounds when studying plant volatile emissions. Sea salt emissions were updated to be dependent on salinity which improved sodium predictions in the Baltic Sea region. The impact of sea salt on atmospheric nitrate and ammonium concentrations and on nitrogen deposition in the North and Baltic Sea region is assessed. Sea salt has a low effect on nitrate concentrations but does not improve them. 3 to 7 % of the nitrogen deposition into the North Sea is accounted to the presence of sea salt. In the Baltic Sea, the contribution is negligible. Ambient pine forest air was oxidized by OH radicals in a PAM oxidation flow reactor during the BEACHON-RoMBAS campaign to study secondary organic aerosol formation. Approximately 4.4 times more secondary organic aerosol was formed in the reactor than could be explained by the volatile organic gases (VOCs) measured in ambient air. The organic aerosol formation can be explained by including an SOA yield from typically unmeasured semivolatile and intermediate-volatility organic gases (S/IVOCs). The study focused on size-resolved PAHs in urban aerosols at a megacity Shanghai site. The results provide us with a mechanistic understanding of the particle size distribution of PAHs and their transport in the human respiratory system; this can help develop better source control strategies. Many Chinese cities now are suffering the high loadings of fine particular matters, which can bring a lot of negative impacts on air quality, human health, and the climate system. The Chinese government generally focuses on the control of the emissions from vehicles and industry. Our results evidently show that the burning of biomass materials such as wood and agricultural residues can lead to the urban air pollution in China. The characteristic of haze covering China is distinct from regions. Mixed-phase clouds are ubiquitous. Process-level understanding is needed to address the complexity of mixed-phase clouds and to improve their representation in models. This study illustrates steps to identify the impact of a microphysical process (riming) on cloud Doppler radar observations. It suggests that in situ observations of key ice properties are needed to complement radar observations before process-oriented studies can effectively evaluate ice microphysical parameterizations in models. We compare simulations of ozone and carbon monoxide using a regional chemistry transport model (WRF-Chem) with aircraft observations from CARIBIC program over India during monsoon period. Sensitivity simulations are conducted to assess the influences of regional emissions and long-range transport. Brown carbon aerosols dominate particulate emissions from the burning of Alaskan and Siberian peatlands. They physically occur as amorphous "tar balls" with negligible black carbon mixing. They absorb very strongly in the shorter visible wavelengths, characterized by a mean Ångström coefficient of ≈ 9. These aerosols could result in a net warming of the atmosphere, provided the albedo of the underlying surface is greater than 0.6. Losses of vapors to walls of chambers can negatively bias SOA formation measurements, consequently leading to low predicted SOA concentrations in air quality models. Here, we show that accounting for such vapor losses leads to substantial increases in the predicted amount of SOA formed from VOCs and to notable increases in the O : C atomic ratio in two US regions. Comparison with a variety of observational data suggests generally improved model performance when vapor wall losses are accounted for. Blarck carbon aging significantly affects its global distribution and thus climatic effects. This study develops a microphysics-based BC aging scheme in a global model, which substantially improves model simulations of BC over the remote Pacific. The microphysical scheme shows fast aging over source regions and much slower aging in remote regions. The microphysical aging significantly reduces global BC burden and lifetime, showing important implications for the estimate of BC radiative effects. We performed a a month-long sensitivity study of obs-nudging on meteorology and ozone chemistry. Notable increases in temperature and wind performance were observed after obs-nudging with hourly nudging files. PBL height also matched better in the sensitivity case. The model ozone improved at ground level and aloft but to a lesser degree. An examination of a high ozone episode showed that the current nudging process does not perform consistently – quite well at times while poor at other times. Atmospheric boundary layer (ABL) model coupled with detailed atmospheric chemistry and aerosol dynamical model was used to quantify the role of aerosol and ABL dynamics in the vertical transport of aerosols at a pine forest site in southern Finland. Simulations showed that under dynamical conditions the particle fluxes above canopy can significantly deviate from the dry deposition into the canopy. The deviation can be systematic for certain particle sizes over a period of several days. This paper presents a bottom-up methodology based on the local emission factors, complemented with the widely used emission factors of COPERT model and near-real-time (NRT) traffic data on road segments to develop a high temporal/spatial resolution vehicle emission inventory (HTSVE) for the urban Beijing area. The results show that the vehicle emissions of NOx, CO, HC and PM were 10.54 × 104, 42.51 × 104 and 2.13 × 104 and 0.41 × 104 Mg respectively. Based on a vehicle emission inventory with high temporal–spatial resolution established by bottom-up methodology, this paper evaluates the performance of the CUACE model and investigates the vehicle emission contribution (VEC) to ambient NO2 and PM2.5 with an emission source sensitivity method. With good performance of pollutant concentrations, numerical simulation revealed that the mean VEC is 55.4 and 48.5 % for NO2 and 5.4 and 10.5 % for PM2.5 in July and December 2013 respectively. 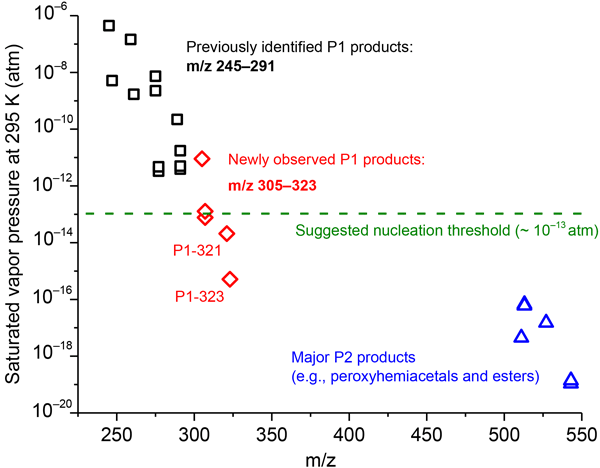 This work represents the first online chemical characterization of the PM2.5 using a high-resolution time-of flight aerosol mass spectrometer during extreme haze events China. The application of novel source apportionment techniques allowed for an improved identification and quantification of the sources of organic aerosols. The main sources and processes driving the extreme haze events are assessed. After a period of stagnation, atmospheric methane started to rise again in 2007. The main drivers are assumed to be increased wetland emissions and fossil fuel production. Here, we quantify the oil and natural gas emission contribution. Our estimate is inferred from ground-based column observations of methane and ethane. We find a significant oil-gas contribution of at least 39% (18%, 73%) in three emission scenarios, calling for emission reduction strategies in growing oil and gas industries. A significant fraction of airborne particles, which have significant impacts on human health, visibility, and climate, are formed from the oxidation of gaseous precursors to generate low-volatility products. We show here that a sesquiterpene, α-cedrene, efficiently forms high-viscosity semisolid particles with complex composition via mechanisms that involve the highly reactive Criegee intermediate and that high molecular weight products play an important role in new particle formation. The AM (annular mode) is the most important internal mode of climatic variability at high latitudes. Upper tropospheric water vapour (UTWV) at high latitudes increases by up to ~ 50 % during the negative phase of the AMs. The response of water vapour to the AMs vanishes above the tropopause. The ultimate goal of the study was to improve UTWV trend uncertainties by explaining shorter-term variability, and this was achieved by accounting for the AM-related response in a multiple linear regression. We report for the first time that the semi-annual oscillation (SAO) is one of the dominant oscillations in the nighttime lower ionosphere, using ground-based measurements of VLF signals reflected off the lower part of the ionosphere. We conclude that the origins of this oscillation are oscillatory changes of the D region's electrical characteristics, driven by NOx transport from the lower thermosphere. This oscillation should be considered in lower ionospheric and VLF wave propagation models. Harmonized source apportionment of atmospheric particulate matter (PM10 and PM2.5) at 5 EU cities (Barcelona, Florence, Milan, Athens and Porto) reveals that vehicle exhaust (excluding nitrate) plus non-exhaust contributes 16–32 % to PM10 and 15–36 % to PM2.5. Secondary PM represents 37–82 % of PM2.5. Biomass burning varies from < 2 to 24 % of PM10, depending on the residential heating fuel. Other sources are local dust (7–19 % of PM10), industries (4–11 % of PM10), shipping, sea salt and Saharan dust. This paper presents the first trial of analyzing amount of chlorine activation on different PSC compositions by using match analysis on trajectories initiated from PSC locations identified by CALIPSO/CALIOP measurements. The measured minor species such as HCl and ClO by MLS are compared with ATLAS chemistry-transport model (CTM) results. PSC growth to NAT, NAT/STS mixture, and ice were identified by different temperature decrease histories on trajectories. Transit properties across the TTL are studied using forward and backward Lagrangian trajectories between cloud tops and the reference surface 380 K. The tropical domain is subdivided into 11 subregions according to the distribution of land and convection. Due to the good agreement between forward and backward statistics, we estimate the contribution of each region to the upward mass flux across the 380 K surface, the vertical distribution of convective sources and of transit times over 2005–2008. We performed an irradiance forecast experiment based on analysis of hemispheric sky images and evaluated results on a large data set of 99 pyranometers distributed over 10 × 12 km. We developed a surface irradiance retrieval from cloud information derived from the images. Very high resolution forecasts were processed up to 25 min. A main finding is that forecast skill is enhanced in complex cloud conditions leading to high variability in surface irradiance. We develop a new approach to estimate global emission of primary brown carbon from biomass burning and biofuel use and explicitly simulate brown carbon aerosol that has not been considered in climate and air quality models despite of its importance for solar absorption at UV and short visible wavelengths. Using our best simulation results, we estimate radiative effects of brown carbon aerosol for climate and photochemistry. We present a new global model to simulate the atmospheric transport of toxic contaminants (PCBs). We evaluate the model against PCB observations in the northern hemisphere midlatitude and Arctic atmosphere. We then use the model to calculate global budgets of PCBs and to examine the influence of climate- and emissions-driven processes on Arctic atmospheric concentrations. We find that processes occurring outside the Arctic have a greater influence on Arctic PCBs than those occurring within. Three microphysical approaches are proposed to incorporate mutual effects of particle charging and coagulation in predictions of transient charge and size distributions of atmospheric particles, including radioactive aerosols. The three approaches have different levels of complexities and are applicable to various laboratory and field atmospheric studies. Also, these approaches can be easily incorporated into aerosol transport models at different scales to account for particle charging effects. A guide to cirrus clouds is compiled from extensive model simulations and aircraft observations. Two types of cirrus are found: rather thin in situ cirrus that form directly as ice and thicker liquid origin cirrus consisting of uplifted frozen liquid drops. Over Europe, thinner in situ and liquid origin cirrus occur often together with frontal systems, while over the US and the Tropics, thick liquid origin cirrus formed in large convective systems are detected more frequently. As motivation for air quality research, many studies cite the fact that exposure to particulate matter is associated with premature mortality. Recently, more studies have also tried to quantify this burden; however, there are many data sets that can be used and many different methodological choices to be made. In this paper, we seek to explain the different sources of uncertainty in health impact assessments through the example of using model and satellite-based PM2.5 concentrations. This study linked a long-term and near real-time measurement of NH3 at one of China’s flagship supersites with a vehicle source-specific campaign performed inside and outside of a major freeway tunnel in Shanghai. Our results clearly show that vehicle emissions associated with combustion are an important NH3 source in Shanghai urban areas and may have potential implications for PM2.5 pollution in the urban atmosphere. The flying laboratory CARIBIC onboard a passenger aircraft measured trace gases and aerosol particles in the upper tropospheric Indian summer monsoon anticyclone in summer 2008. We used the measurements together with meteorological analyses to investigate the chemical signature of the northern and southern part of the monsoon, the source regions from where the air was entrained into the monsoon and which parts of the world received polluted air that had been chemically processed in the monsoon.